Cigar Finder released version 1.3 for Android on Wednesday in the Google Play store, offering improved geo-location and search functions for all Android users. Cigar Finder easily locates shops, bars and lounges. Currently, the app has about 11,000 establishments in its database - more listings in the U.S. and Puerto Rico than any other app on the market. 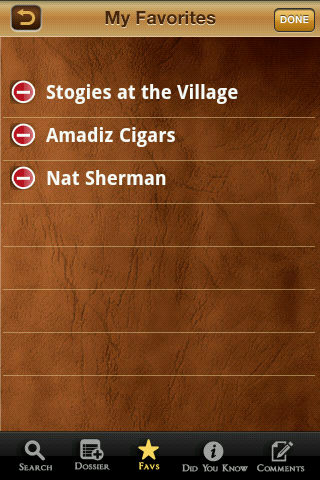 It also helps users discover and share their favorite local bars and shops with other stogie fans. The free mobile app, also available for iPhone in the App Store, was released into the Android Market on March 5 after the launch of updated version 1.1 for iPhone. CigarFinder LLC plans to release another iPhone version to the App Store within the next few weeks and routinely continue publishing updates for both mobile platforms. Cigar bars, retailers and lounges can add a description and other details to their Cigar Finder page. For cigar aficionados, the app's appeal its easy format and extensive database - not to mention some of the exclusive discounts. Merchants and retailers can easily complete their profile here. The mission of CigarFinder LLC is to connect and enhance the experience of the cigar community. The company launched its first product, Cigar Finder for iPhone, in August 2011. To learn more, visit the Cigar Finder website or Facebook page. 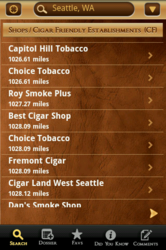 More screenshots are available on the Cigar Finder for Android page.